- The combined use of fertilizer “Geo Humat” ® with mineral fertilizers, pesticides in agriculture can reduce fertilizer expenditure for 30-40%, also pesticides for 20-30% that besides economic benefit it reduces technogenic impact on the environment. 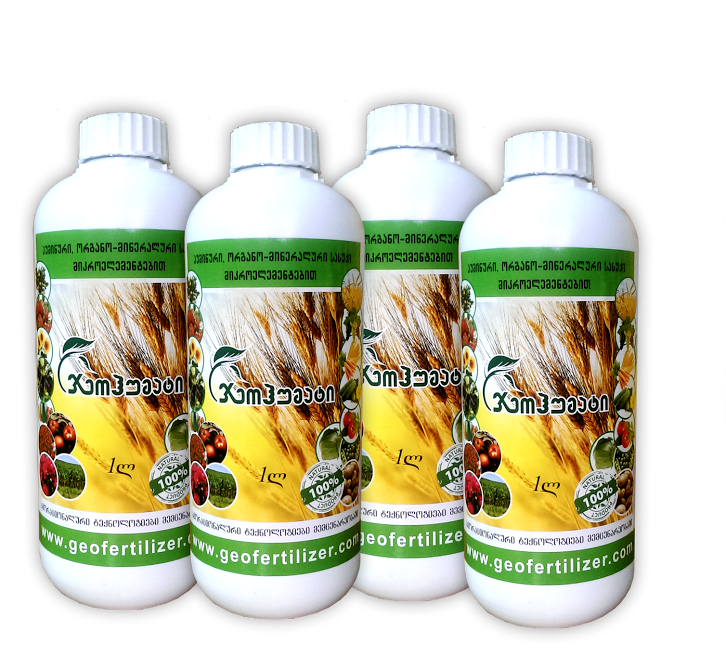 Fertilizer Geohumate is usude for combined treatment of agricultural crops, starting with treatment of seed graintsor seedings to futher processing of vegetating plants. 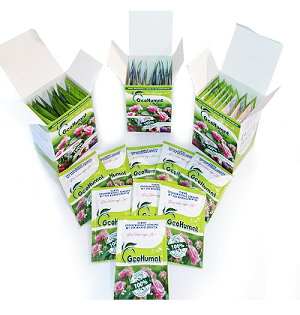 Root wotering is also effective, if appropriate for a given cultivation technology. Fertilizer GeoHumate can be used in drop irrigation systems due to 1--% solobility in open ground as well as indoor cultivation. It can be easily used in major models of sprayers, including small and ultra-small sprinklers. Fertilizer GeoHumate after a long storage period can prepiciate, so before use it is recommended to shake the working canister. No special pre-filtration is required before use. Concentrated solutions of the preparation have neutral alkaline reaction, pH 7,2-7,5. Therebofore it is recommended to add the preparation directly into the working solution or service tank to reach reach the concetration up to 1,0-0,5%. Though it is not advisable to solve the preparation is the service tank with pH < 55, that can lead to setting a flocculent sediment of insoluble humic salts. Use of solutions of fertilizer GeoHumate (mark "a" 12%) with concentration over 1% can cause temporary growth inhibition in plants. In case of such overdose of the agent, it is necessary to conduct irrigation or spraying of plants with clean water. GeoHumate used in drop feed systems or closed protected areas to boost and develop the plant root system and the entire plant. The use of Geohumate facilities an increase of the ratio of assimilation of nutrients fromfertilizers and soil. 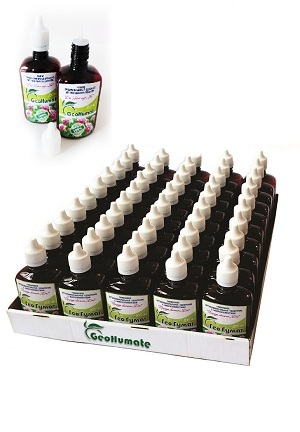 Owing to thestimulatingeffect on the developmentofthe root system, Geohumate increases its intake capacity and improves drought tolerance of plants. 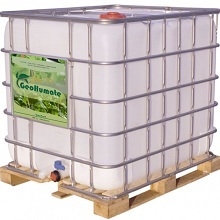 In a protected area Geohumate is especially ifficient in drop feed systems along with low-capacity techniques of groowing vegetables. The use of Geohumate is an protected areas facilitates protection of plants against a temporarydrop of temperature in the greenhouse. Geohumate is effectively used on open ground to boost growth and optimize mineral nutrition, when combined with dressings of fully solube mineral fertilizers. In soil Geohumate facilititates the development of nitrogen-collecting bacteria, which extract nitrogen from the air saturate the soil in the form easily consumabe by plants. On open ground Geohumate is applied in drop feed systems and foliar dressing during the most important physiological phases of plant development. 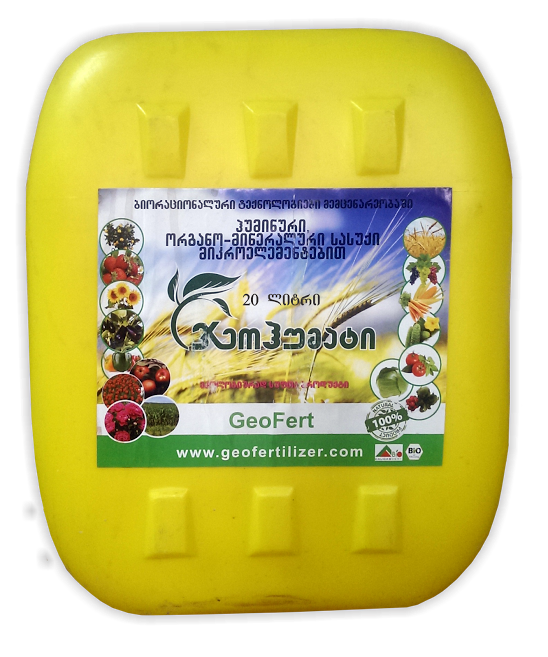 Use of the fertilizer Geo Humate ensures increase of yield by 15-20% in average and improves receipt of nutrients in plants by 10-20%. Efficiency of the humic-mineral fertilizer Geo Humate is equally high in open closedares. it should be noted that the fertilizer GeoHumate has been found not only to increase the yield and weight of the fruits and speeds up the ripening time, but also to improve the quality of products. For instance , it increase sugar contect in beet, vitamin C contect is apples and other fruits and reduces nitrate concerntratios in vegetables. Besides that this fertilizer has positive efect on plants in unfavorableconditions caused by externalfactors (drought, freeze, excessive amount of nitrogenand pesticides, lack of oxygen, different diseases). Extreme conditions can detain many physiological processes, while the humic acids hinder it. After irrigation of oil with the fertilizer GeoHumate the vital activity of soil micro-organism is increasing, resulting in acceleration of decay of chemical means used for plant protection and correspondinglyin more ecologically pure production. Humic, Organic-Mineral Natural Nutrition Of Plants. Nowadays there is an uprise of interest to humic fertilizers throughout the world, i.e. humates. Humic compounds, which are physiologically active substances, regulate and enhance metabolism in plants and soil. Humic substances have been found not only to increase the yield and weight of the fruit and speed of the ripening time, but also to improve the quality of products, increasing the content of sugar, vitamins and reducing the quantity of nitrates. In 2009-2010 a group of scientists from the "GeoFert" LLC developed a new production technology for producing ecologically pure humic, organic-mineral fertilizer with microelements “GeoHumate” (mark “a” – liquid 12%), using Leonardite(lignite) of the Akhaltsikhe deposit (Georgia) as row material. Compared to other organic products, Leonardite is distinguished by high content of humic acids (85%), as it is the final product of humification which lasts for about 70 million years. • Lowering of deficit of consumable forms of micro-elements. • Sustainable increase of yield of all crops (yield of crops is increased over 15-20% in general). - Sugar – by 6-8%. • Increases resistance of plants to ionizing radiation, drought, and freeze; prevention of penetration of heavy metals from ground waters and soil; lowering of nitrate concentrations while treating plants with nitrogen manure. • Effective nutrition of plants with macro-elements (NPK) and micro-elements (B, Co, Mo, Mn, Zn, Cu, I). • Improves soil structure and increased content of humus in soils. Rehabilitation of soil fertility. • Contribution to forming the lumpy structure of the soil, as well as to decaying of less digestible mineral substances, improving of buffering characteristics of soil and concentration of carbonic acid around the plant roots which is needed for construction of plant tissues together with water, etc. • The influence is stipulated by different simultaneous processes: hormonal action; facilitation of receipt of mineral substances by plants; active participation in metabolic processes in plant cells by preliminary enzymatic degradation which leads to development of stimulating compounds. All the above mentioned factors in general influence the productivity and quality of the yield. - Zn<0,4%; Cu<0,08%; Mn<0,083%; Co<0,07%; Mo<0,3%; B<0,3%; KIO3 <0,033%. 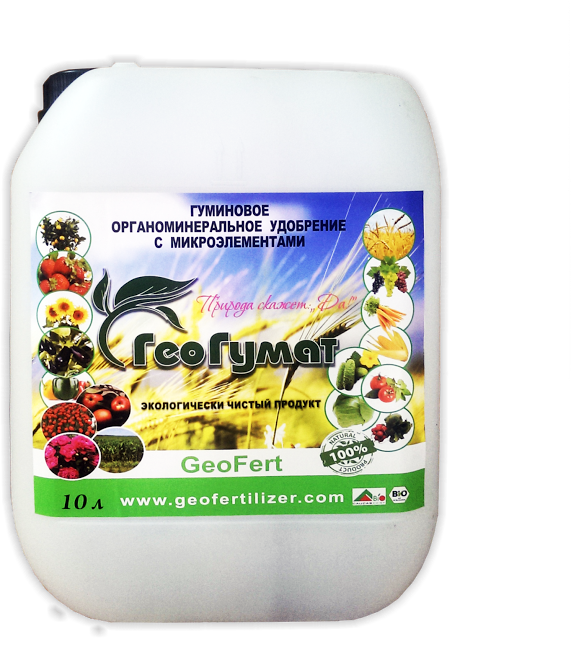 Use of the fertilizer "GeoHumate" ensures increase of yield by 15-20% in average and improves receipt of nutrients in plants by 10-20%.